Happy Easter! It is time to get holy – or at least to explore the Holy Sites of DC. This tour has become a favorite among visiting family and friends. The American capital is not only blessed with monuments and world-class museums, it is also a showcase of the amazing religious diversity of this young nation. The guide-books rightly point out the National Cathedral as the most important house of worship in town: It is built in a beautiful neo-gothic style, it hosts wonderful concerts, and it is where U.S. presidents go for their inaugural mass. Yet, if time is limited, it is not the first place where I take European guests. They have more than enough cathedrals over there – so its fun to explore something more exotic. The “Basilica of the National Shrine of the Immaculate Conception” in North East DC must be one of the wildest things Catholicism has ever produced. The biggest Catholic church in North America is overloaded, garish – and pretty awesome. The huge mosaic Jesus in the vault above the altar looks as if he has been working on his bicepses in the gym. The ‘Arnold Schwarzenegger’ Jesus is surrounded by blue tiles, creating the atmosphere of a Turkish bath. The side walls are covered by an explosion of multi-color mosaics depicting the Creation. A testament to the global reach of the religion and to its patron saint, the basilica’s alcoves are dedicated to apparitions of the Virgin Mary in all corners of the world – from “Our Lady of Lebanon” to “Our Lady of La Vang” who appeared in 1798 to Vietnamese Catholics hiding from persecution in the rain forest. This does not mean that you won’t also find the classics: A corner is dedicated to our French Mary of Lourdes, and you will find a replica of the famous Black Madonna of Altötting in Bavaria. A more recent historical artifact is the chair on which Pope Benedict sat when he came to Washington in 2008. Here is one piece of advice if you decide to take a tour of the Masonic House of the Temple on 16th Street NW: Don’t bring your copy of Dan Brown’s “The Lost Symbol”. While the book is available in the temple gift shop and while it is true that the author researched for his book in the temple’s library, the Freemasons who volunteer to guide visitors through the building secretly roll their eyes at the pop fiction rendition of their ‘men’s club’. 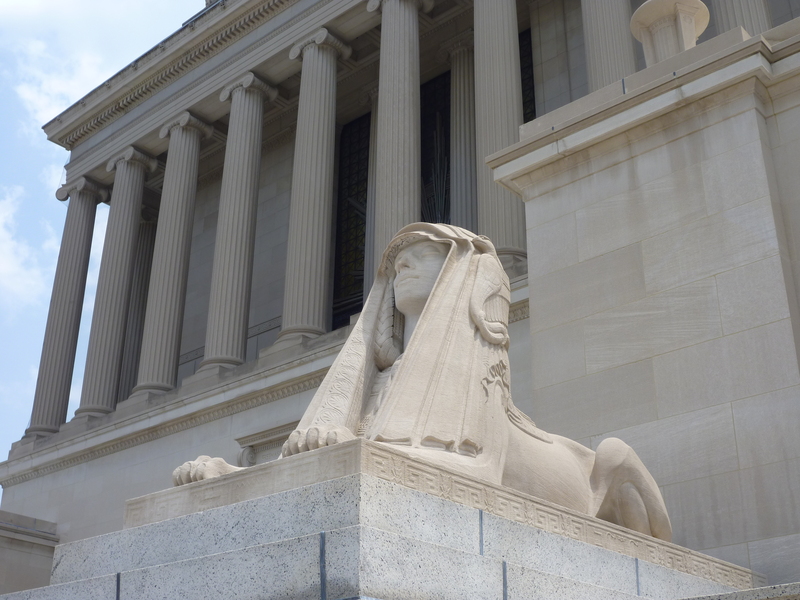 Even without Dan Brown there is enough mysterious symbolism in this temple that was modeled after the ancient Mausoleum of Halicarnassus and is guarded by two giant stone sphinxes. The limestone façade is ringed with 33 columns. 33 light bulbs in the lobby’s chandelier represent the 33 Masonic degrees. In the Temple Room on the second floor, visitors are allowed to take photos on the wooden throne decorated with purple velvet. But no outsiders are allowed when the Supreme Council convenes, and the Masons perform their secret rituals. On a table in front of the throne, you will find copies of the Bible, the Torah, the Koran and the Bhagavad Gita. The Scottish Rite Masons, who trace their origins to Cathedral master builders in medieval ages, are not bound by any particular religion. They engage in philanthropy and act like a fraternity with spiritual ambitions. The temple has an impressive portrait gallery of famous members – from the astronaut John Glenn over Edward Hoover, the founder of the FBI, to George Washington himself, who in 1793 performed the Masonic ritual of laying the corner stone of the U.S. Capitol. If you ever wondered if Jesus speaks your language – he does at the visitor center of the Mormon Temple in Kensington, Maryland. A giant white statue of the resurrected Savior awaits you in the hall, and if your guide presses the right button, you will hear his words from the testament of John in German, Chinese or Swahili. Driving North on the Beltway from DC, you might think that a spaceship landed next to the highway. 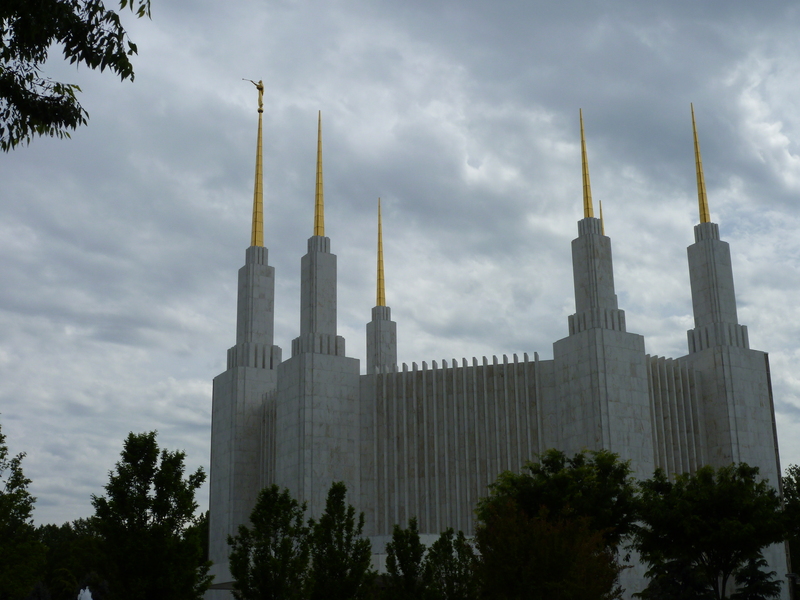 The futuristic looking white building with six golden spires pales in comparison to the gigantic Mormon temple in Salt Lake City. But it is as close as you can get to this uniquely American religion without making the trip to Utah. Even though infidels are not allowed to enter the temple, the visitor center is an adventure in itself. Young Mormon missionaries will show you pictures of attractions inside the temple, such as the Baptismal Font, in which Mormons perform proxy baptisms for their dead ancestors, or the Sealing Room, where couples are married not just for life, but for eternity. An exhibition shows scenes from the Book of Mormon which tells the story of ancient Israelite tribes who migrated to the American continent. According to the faith, the prophet Joseph Smith found the text written on golden tablets in 1823 in upstate New York. On a screen you can watch the testimonies of the current church leadership, the Quorum of the Twelve Apostles, among them the former German Lufthansa executive Dieter Uchtdorf. Have fun exploring the Mormon universe. And if you have further questions, the eager missionaries from the visitor center would be happy to visit you at home. Happy Easter! 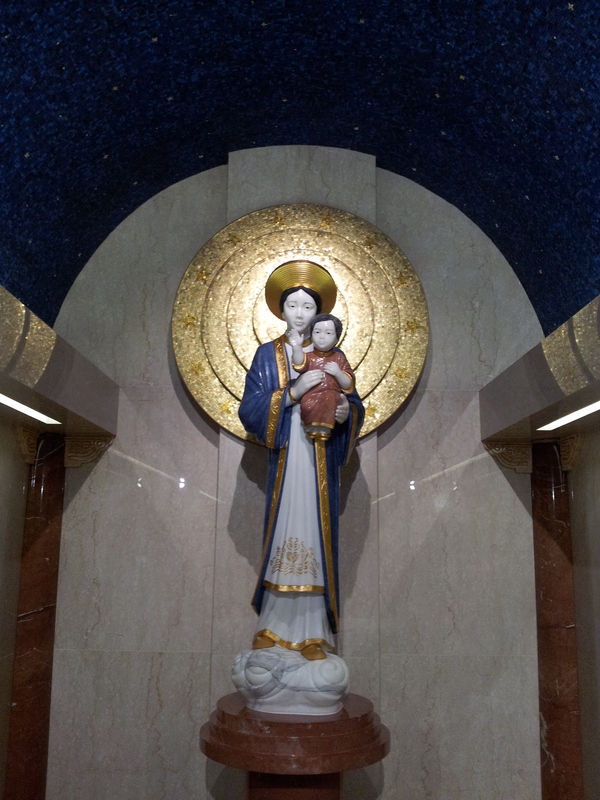 This entry was posted in Local Blogroll and tagged Basilica of the Immaculate Conception, National Cathedral, Scottish Rite Temple, Washington Mormon Temple. Bookmark the permalink. I remember driving some visiting teachers from Germany around D.C. and listening to their many “oohs” and “aahhs” and comments like “unbelievable” when they saw the huge variety of religious structures in the District. These 3 are a good sample, but there are hundreds more!